Physical plant managers at universities must maintain an efficient workforce, but that can’t be accomplished without adequate wellness programs that also keep workers healthy. In that sense, the university physical plant department occupies a meeting point between the principles of both hard and soft facilities management. Managers must consider infrastructure, equipment, and the valuable employees who use that equipment to keep facilities clean and well-maintained. On the productivity side, injured workers can’t do their jobs. From the human perspective, jobs should never contribute to illness or injury. Improving workplace ergonomics accomplishes both goals, and often at a limited cost to employers. That’s why the California Division of Occupational Safety and Health (Cal/OSHA), the state’s occupational health program, published a pamphlet called Working Safer and Easier for Janitors, Custodians, and Housekeepers. While this publication is more than 10 years old, not every employer has yet embraced its ideas — and they remain excellent ideas. Cleaning is intense, fast-paced, and physically demanding work. It is also repetitive, requiring the use of force and awkward body postures … Planning efficient workflow with your staff is critical. Avoid rework and accidents by setting reasonable workloads. Remember: productivity and work quality go down as fatigue sets in. Allow adequate rest periods for staff. It may seem like a small thing, but typical straight-rod mop handles actually force the body into unnatural postures that can place strain on muscles and nerves. According to the ergonomist Rupesh Kumar’s doctoral thesis at the Lulea University of Technology, an adjustable, curved handle is much easier on the body for all reaching tasks, such as cleaning floors and replacing light bulbs in distant lamps. Mechanical Devices for Repetitive Cleaning Tasks. Some work is never done. No sooner have janitors emptied the building’s trash than they have to go collect the next round. While emptying garbage is a regular part of a cleaner’s day, it’s also one of the most risky things they’ll do in a shift, ergonomically speaking. 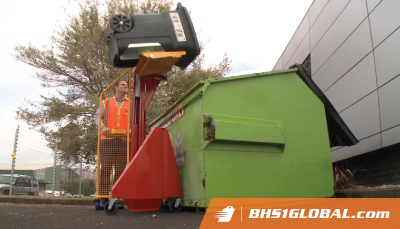 Bin Tippers lift and empty trash bins, protecting workers from the strain. They also speed the task up considerably. It’s essential to keep all cleaning and material handling equipment in good shape. Otherwise, workers exert extra force when operating them. Implement frequent inspections for all rolling equipment, and move quickly to repair or replace malfunctioning gear. This is, of course, just a light sampling of the techniques and equipment that employers should use to realize the dual benefits of health and productivity for physical plant workers. To learn more, check out the Occupational Safety and Health Administration’s ergonomics resources, available here. A robust ergonomics program, including evaluation, planning, training, and equipment, can help to keep wellness and efficiency balanced in the physical plant department. Make the commitment today. Kumar, Rupesh. “Ergonomic Evaluation and Design of Tools in Cleaning Occupation.” Diva-Portal. Lulea University of Technology, 2006. PDF. 2 Feb. 2019. “Working Safer and Easier for Janitors, Custodians, and Housekeepers.” DIR. Cal/OSHA, California Department of Industrial Relations, 2005. PDF. 2 Feb. 2019.